Arimaa is a game where stronger animals like elephants and camels try to push and pull the weaker ones from the opposing team into traps while one of the rabbits tries to sneak across the board and harmlessly reach the other side. The first player to get a rabbit to the other side wins. This may sound like a simple kids game; and while it is easy enough for your kids to learn and enjoy, you will find that it is also a very deep game that can take a lifetime to master. Arimaa is one of the deepest strategy games ever invented in the history of mankind, but designed to look intuitively simple. In just the first ten moves of Arimaa there are more possible games than there are atoms in our universe. No two games of Arimaa are ever the same. There is much to learn and discover about this intuitively simple, yet intellectually challenging game. The rules are simple and intuitive. Even if you've never learned how to play Chess, you can learn to play Arimaa in just five minutes. Arimaa has existed in an online form since 2002 and has only been since 2009 that Zman games published it in physical format. That being said, I still vastly prefer it as an online game and my review is based on that format. In Arimaa, your goal is get one of your 8 rabbits across the board to the other side. Doesn’t sound too hard right? Each player is given a set of pieces that match Chess in number, but not in utility. You are given one Elephant piece. He is the general who will command your troops and cannot be pushed or pulled around. He freezes all others in their tracks. He can’t be killed unless you decide to suicide him. The Camel is the 2nd strongest piece and you get one of them as well. He will spend the majority of the game trying to stay away from the Elephant while still creating havoc on the opposing horses. The horses are 3rd in command and you get 2. They are key pieces as they work very well in attack with the Elephant and also as defense of your own home traps. Dogs are next, followed closely by cats. They are support pieces which can get more powerful later in the game should Camels or Horses get captured. Finally, the 8 rabbits. Rabbits are of a different breed altogether as they are the only pieces that can’t move backwards. They are also frozen and can be pushed and pulled by all other pieces save enemy rabbits. But the beauty of this game is that you need those weak rabbits (well 1 of them anyways), as that is how you win the game. To setup your pieces, you can place them in any manner you see fit in your back two rows (although over time there have been some preferred setups develop). On your turn, you get to make 4 moves with your pieces (all pieces move one space horizontally or vertically regardless of strength). You can move 4 pieces once or 1 piece 4 times, or any other combination. You can also push and pull enemy pieces which take 2 moves, one to move yours and one to move your opponents. There are also 4 traps on the board in which your piece will be captured unless you have a supporting piece next to it keeping it alive. Then there is the freeze rule. Basically Elephants freeze all other enemy pieces, Camels all others except Elephants, and so on down the line to cats who can only freeze rabbits. Pieces are frozen ONLY if there is no other supporting piece next to it. Within a few games, you will have mastered all of the rules of the game. Heck, my 6 year old son knows HOW to play the game. But to play the game well is another matter entirely…. For me, Arimaa is not just a game, it is so much more than that. It is easy to learn and extremely deep at the same time (the ratings among human players at Arimaa.com range from 1000 to the 2600’s). It is a game I never get tired of no matter how much I play (nearly 2000 games over 5 years). It is a community (there is so much to do and get involved in – tournaments, leagues, championships, bot bashing records, bot development, postal matches, forums, etc.) It is challenging (no shortage of opponents or bots to play at any level). It is infinitely replayable (no two games are alike, it is amazing how many different ways a game can develop). It is versatile (you can play brain-burning postal matches or blitz games at 15 seconds per move and they are equally as enjoyable). It is an investment (every game played feels like a stepping stone to learning a new trick or tool to play better the next time). I could go on and on. Arimaa is an abstract strategy game, but for me it has just enough of a theme and flavor to it that keeps me engaged. Many other abstracts fall flat for me because I feel no connection to the game. Arimaa feels more like a miniature battle game (albeit with no luck). Arimaa is a game that I keep coming back to again and again after the newness of other games wear off. I can picture myself still playing this 10 years from now which is something I can’t say for sure for any other game I own. If this review has at all interested you in the game, I would highly recommend you try it out at Arimaa.com. You will be glad you did. 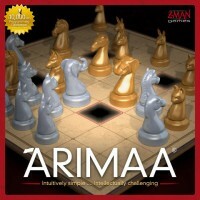 It can be easily seen that Arimaa is a chess-like game. It is played on a 8*8 square board. Each player has 16 pieces: two unique ones, three pairs and one set of 8. And Arimaa is a complete information, zero-luck, zero-sum, two-player game – just like Chess. But if you take a look you see that there are more differences than similarities between these two games. The first difference is the setup. In Chess it’s fixed, in Arimaa setting up the pieces within two first rows of the board is the first “move” of each player. Any combination is legal. Some of the setups are more effective than the others but in fact each game may start from a different position. This makes Arimaa much less a memorization game when compared to Chess (as you can’t play Chess above a certain level without memorizing a number of openings). – Advance one of their 8 Rabbits to the farthest line of the board. – Capture all eight opponent’s rabbits. – Immobilize (“stalemate”) the opponent making them have no legal move. Another difference is the piece strength. In Chess it’s situational. A pawn can capture a queen as well as a queen can capture a pawn. In Arimaa there is a defined hierarchy with an Elephant being the strongest and a Rabbit the weakest piece. Stronger pieces may bully weaker opponent’s pieces while being unaffected by them or by pieces of the same type. As for capturing: It is also quite different from chess-like “stepping on” or checkers-like “hopping over”. A piece is captured only if it stands on one of the four “trap squares” with no friendly piece on any of the adjacent squares. And – finally – the piece movement rules. Unlike in Chess, in Arimaa all pieces move according to the same rules: one step left, right, forward or backward (with the exception of Rabbits that can’t go back). During their turn a player may make one to four such steps assigned at will to up to 4 pieces. Okay. So how does playing this game feel like? Arimaa is undoubtedly easier to learn than Chess. But once you get the rules you realize that you can keep learning the game all your life. It is the game that if you start to like it, you will want to play your tenth game, and the hundredth, and the thousandth. You will still have something to learn here even being a reigning world champion. Here comes another common point with Chess: Arimaa is not only a game, it’s a intellectual sport! And it should be treated as one. When I want a brain-burner – I play Arimaa. Yet when I want to play a game without a necessity of making my mind work at its best – I get other games. The goal of the game is to get one of your rabbits to the opposite side of the board. At the game start, the starting (gold) player can set up your pieces in any formation in the first two rows of the board. Then, the second (silver) player may respond and set up his side of the board as he chooses. All pieces share the same movement, being able to move orthoganlly forward, backward, left, or right, except for the rabbit, which can’t move backwards. Players make 4 moves per turn. Additionally, a stronger pieces may push a weaker opposing piece by moving the weaker opposing piece into one of its adjacent spaces, and then moving your stronger piece into the now vacant space. Stronger pieces can also pull weaker pieces into its space and move itself into an adajacent space. It takes an extra movement to push or pull another piece. Weaker pieces that are standing next to a stronger piece and no friendly pieces are frozen in place and can’t move. There are also four spaces on the board that are Trap spaces, and any piece on a trap space without a friendly piece adjacet to it is immediately captured. This game is in many ways like Chess in that all game information is public-knowledge and the game is deterministic and highly strategical. However, it is much more difficult to make a capture and there are so many possible moves in a turn (over 16,000!) that it is not always obvious what the best move is. Additionally, since you have 8 different pieces that can all win you the game by getting any one to the other side, this allows players to still be in the game and posing a valid threat to the opponent after having lost many strong pieces. In fact, I won one game with only 5 rabbits left alive at the end. Even my elephant was captured! Though I’ll admit, I sacrificed my elephant for the last-turn win. The components in this game are great. The pieces are clearly identifiable and unique. They’re weighted well so they don’t easily fall over. In fact, I often have to push them over deliberately to put them back in the box. The board itself can be flipped over and used as a regular chess board. And since you can also play the game with a regular chess set, it makes the game widely accessible to try out. Though I do greatly enjoy the game much more with the Arimaa set. The rules are pretty simple and straightforward, although there can seem to be a few nuances and special exceptions, such as rabbits being unable to move backward. All in all, I highly recommend this game and encourage you to try it out! Arimaa is easy to learn even for youngsters. The rules are quite simple with a few subtleties such as freezing and the way rabbits cannot step backwards. These (subtle) rules result in a complex and interesting board game. Top players are often unsure about which moves are best in certain positions. However, even newbies are able to describe what is happening in a game just by looking at the board. The Arimaa community has developed a rich vocabulary to help play and discuss Arimaa games. When first learning Arimaa, you must focus on capturing pieces, keeping your own pieces safe, and stopping your opponent’s rabbits from goaling. As you become comfortable with capture patterns, you will learn to look for other positional advantages such as hostages, frames, and blockades. Eventually, you will be able to focus on the tensions of having an active yet safe camel and choosing when to race for goal. In many games, it is clear what objective each player is working towards, but entirely unclear which player will come out on top. This simultaneous clarity and depth is why I love Arimaa. Each game has a unique feel, and I always sense that there is more strategy to learn. Add a Review for "Arimaa"